If you’ve been following the news, or go on Facebook, or live anywhere besides the bottom of the ocean, you know it’s been a rough week for this country. Every morning it seems we wake up to some new headline worse than the last. Gun violence appears to be at an all-time high, and race relations feel as strained as they’ve ever been since the Civil Rights Movement. People are literally killing each other in the streets on a daily basis. I don’t know whether I want to read everything about it or nothing at all. This week, I feel deeply grieved for my country, and am hard pressed to hang on to hope for its future. So, frankly, I feel a little glib writing a post about popsicles. Of course, I don’t mean to say that if we all just eat popsicles and sing Kumbayah, the world’s problems will melt away. There are other things I intend to do in the midst of this national crisis, like pray, vote, live my own life and raise my children to live in a way that promotes peace. If you have any other suggestions, I’d sure like to hear them. 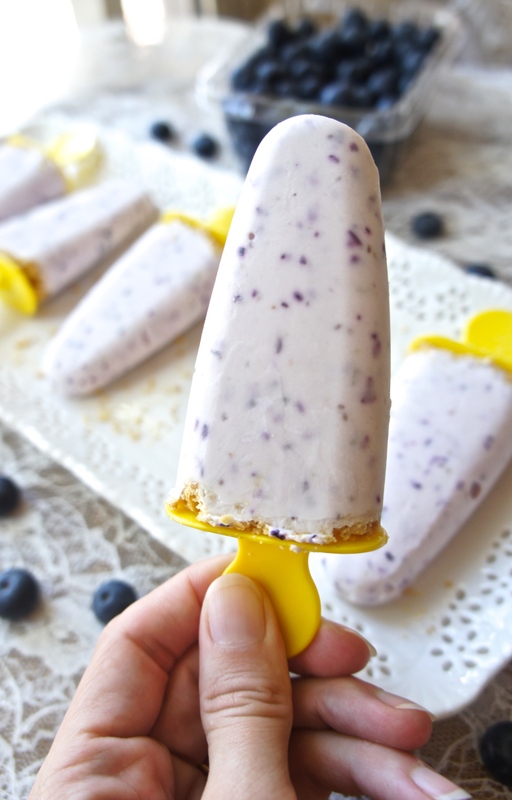 And, on a lighter note, these creamy blueberry cheesecake treats really are especially delicious. 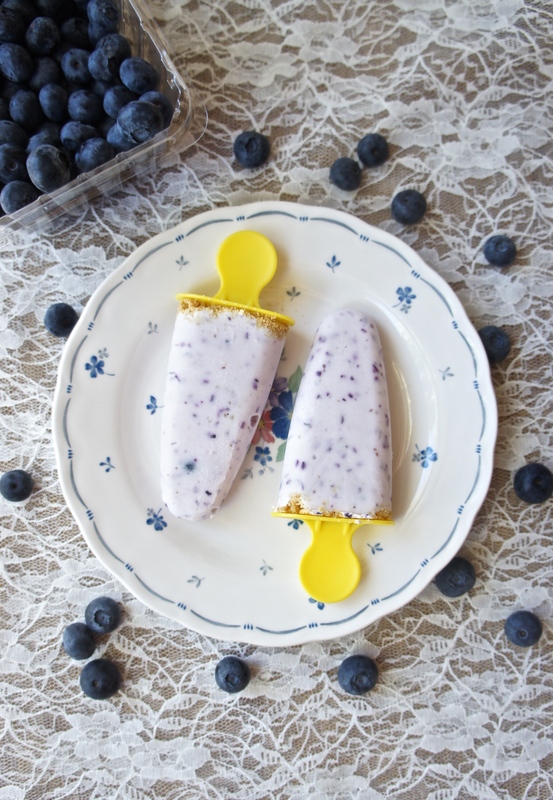 If in the summer heat, you’re craving a little something sweet that comes without too high a calorie price tag, one of these will do the trick. I hope it brightens your day. In a medium bowl, mix cream cheese and yogurt with an immersion blender (or a hand mixer would probably work, too) until smooth. Stir in powdered sugar, then half and half. Add blueberries and mix until incorporated to your liking. 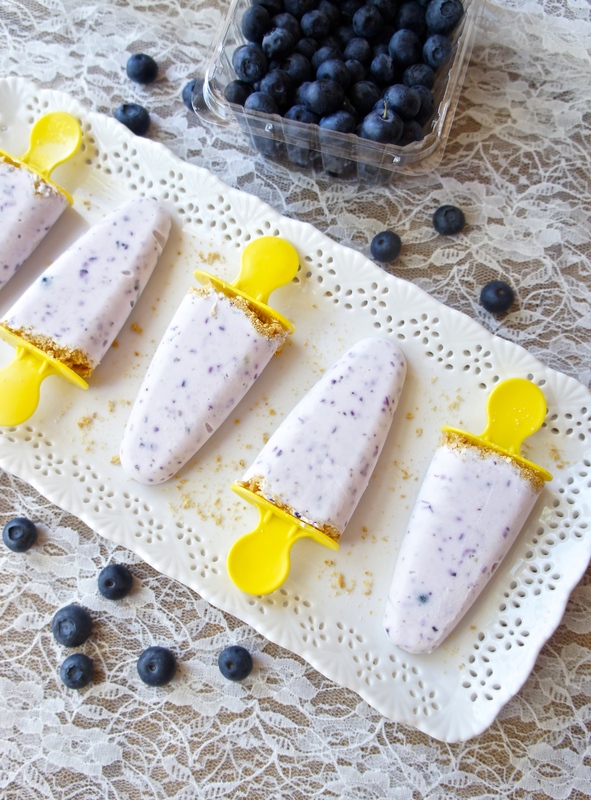 Pour mixture into popsicle molds and sprinkle with graham cracker crumbs. Freeze at least two hours. This entry was posted in Recipes and tagged Desserts, Gluten Free, Snacks. Bookmark the permalink. Somehow, I missed this blog post when you first wrote it, and I’m not sure if you’ll even read my comment now, but I want to say I’m quite proud of you for writing this, my beautiful daughter! The sentiments about our country (which are even more poignant now, a few weeks before this unprecedentedly hideous election) combined with Scripture and a simple recipe for a simple treat, are quite refreshing! Love you.